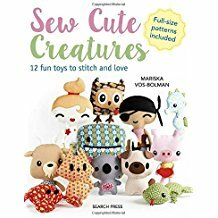 A fun, cute creatures to sew book. The style reminds me of the style of a fabulous Japanese book I used to have 40 years ago. Slightly large heads and smaller bodies. Just 12 patterns to choose from but they do come with full-sized pattern pieces that you need to trace off. Sew by hand or machine. What you get – clear large photos, clear diagrams and written instructions for assembly. An appealing selection of toys that are easy to make. This book was originally published in Dutch in 2016. The author also had a similar book published in 2014 by a different publisher.